Ezekiel “Zeke” Diethelm always had ambitions of joining the military – of spending his life protecting the Republic of Amathea. However, when Zeke tried to enlist he was rejected. Zeke settled for work as a private guard for a merchant-lord in his hometown. 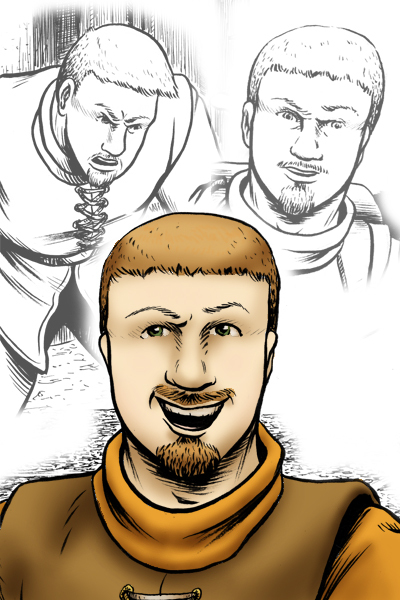 It was working for this merchant that he met his two best friends, Odd and Baltazar. Despite years of little to no action in his guarding job, Zeke’s protective nature still drives him on. When the three are fired from their jobs with the merchant Zeke agrees to wander the countryside with his friends – both to protect them and to seek the noble adventures he feels his been missing his whole life.